WE DO NOT DELIVER TO THE MED CENTER AREA OF TOWN. 2 crab cakes or 2 bacon wrapped shrimp or one of each. 6 to 7 stuffed mushroom caps. 12 to 14 stuffed mushroom caps. (SERVES 3 to 4) A sampler of our calamari, shrimp, and crab cakes. (SERVES 5 to 8) A sampler of our calamari, shrimp, and crab cakes. Ice berg lettuce with chicken, bacon, cheese and tomato. With lump crab, shrimp and bacon. Iceburg lettuce, bacon and blue cheese. Lettuce, tomato, cucumber, shredded carrots, shredded cabbage, and croutons. Served with your choice of dressing. Mixed greens with turkey, grilled chicken, bacon, provolone and mozzarella cheese. Served with your choice of dressing. Choice of Angus beef fillet or Salmon on a bed of your choice of salad. Fresh greens, feta cheese, sliced tomatoes, cucumbers, red onions and olives. Served with your choice of dressing. 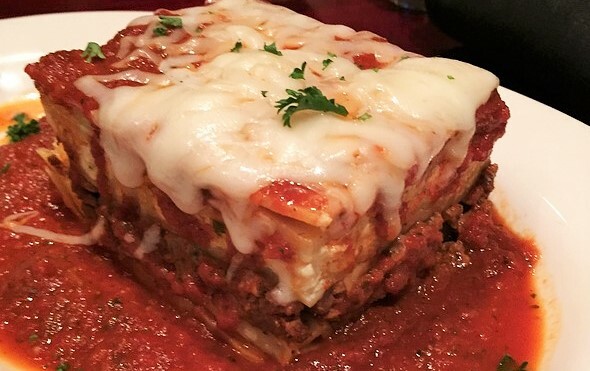 Layers of delicious lasagna, spicy Italian sausage, meat sauce and three cheese topped with marinara sauce and mozzarella cheese. Grilled chicken with green beans and your choice of side. Roasted chicken and herbed cheese wrapped crepe style with your choice of sauce. Grilled chicken breast topped with mozzarella cheese and mushrooms. Served with spinach fettuccine tossed in alfredo sauce. Spinach fettuccine tossed in alfredo sauce. Spinach fettuccine tossed in alfredo sauce with choice of protein or mushroom topping. Choice of Spaghetti or Rigatoni tossed with choice of sauce. Linguine with clams sauteed in a white wine sauce. Almond coated chicken breast topped with mushrooms, garlic, basil and tomatoes. Served with mashed potatoes or choice of pasta. Served with your choice of linguini or cheese tortellini. With spinach fettuccine in alfredo sauce. Spinach fettuccine with alfredo sauce. Jumbo cheese ravioli with pesto sauce. Spinach and eggs fettuccine, peas, mushrooms, and artichokes in a cream sauce. Crab cake and one jumbo bacon wrapped grilled shrimp with side of linguini with clams. Flaky filet lightly breaded and sauteed in extra-virgin olive oil. Served with angel hair pasta tossed with spinach in olive oil and garlic. 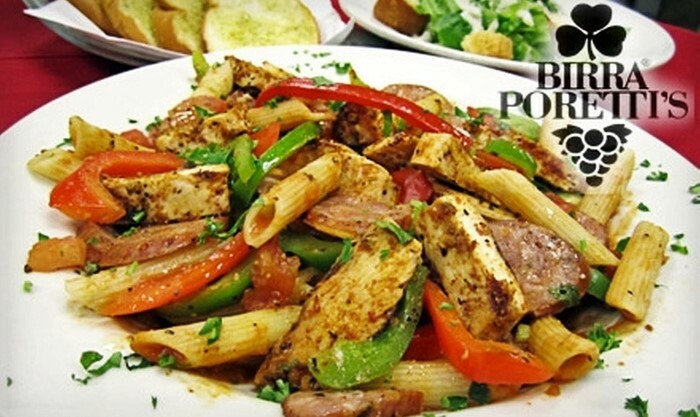 Served with choice of linguine tossed in olive oil and garlic or sauteed spinach. With your choice of tortellini alfredo or linguini tossed in olive oil and garlic. Two prosciutto wrapped scallops, two crab cakes, two jumbo bacon wrapped shrimp with a side of ribbon pasta. Pepperoni, Italian sausage, bacon, fresh mushrooms and red onions. Italian sausage, black olives, green olives, red onions, green peppers and jalapeno. Fresh grilled chicken with alfredo sauce. Fresh mushrooms, red onions, green peppers, black olives and fresh tomatoes. Virgin olive oil dressing, mozzarella cheese and choice of two toppings. Mozzarella cheese and your choice of one topping. Mozzarella cheese and your choice of two toppings. Freshly brewed ice tea served with 10 cups, sweetners and creamer. Flavor choices include: Tropical Tea, Sweet Tea, or China Black Tea.